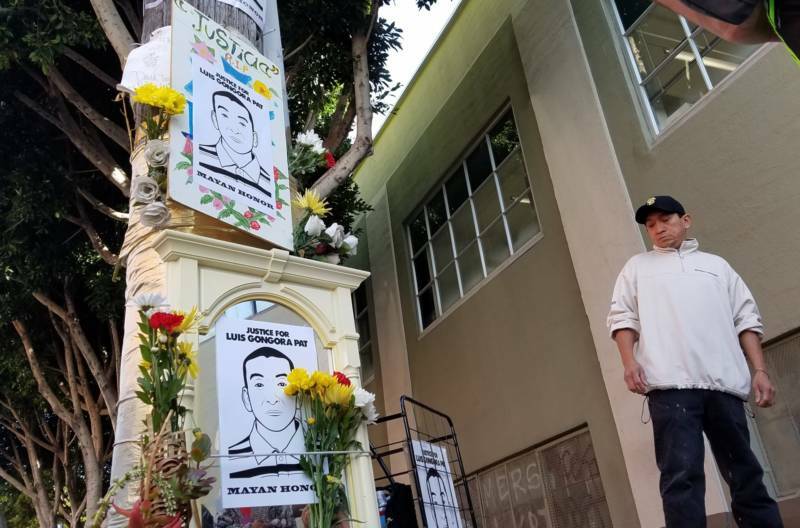 Advocates on Friday joined the family of a homeless man fatally shot by two San Francisco police officers in April at the location of Luís Góngora Pat's death to announce the filing of a federal civil rights lawsuit and to respond to details of a medical examiner's report released last week. The lawsuit alleges Officer Michael Mellone and Sgt. Nate Steger used excessive force and ignored SFPD protocols when they -- along with a third, unidentified officer -- arrived at a Mission District street in response to a call about a man with a knife. The officers were captured on surveillance video on April 7 approaching something outside the camera's frame as they shouted commands to "Lay on the ground!" and "Put that down!" An officer armed with a shotgun that fired "less-lethal" beanbag rounds appears to fire four shots in quick succession, followed by the distinct sound of handgun fire. Video originally published by SFGate. Góngora died nearly three hours later at San Francisco General Hospital. He suffered six gunshot wounds, including one to the left side of his forehead, which advocates and family members have identified as "the only mortal wound." "Mr. Góngora was not running or lunging at the officers when he was shot to death," civil rights attorney Adante Pointer said. "Given the angle of the gunshot wound to his head, and you combine that with the video, it gives you a real clear indication that he was not only not standing when he took that shot, but he was below the angle of the gun. So Mr. Góngora was actually on the ground or going to it when he sustained that fatal injury, and that is clearly excessive and unnecessary." The San Francisco Police Department and other city agencies typically do not comment on cases that are the subject of lawsuits. Police officials did release two batches of partial witness statements and interpretations of witness statements in the days following the shooting, some of which indicate Góngora was moving toward the officers with a knife in his hand. Stephanie Grant said the day of the shooting that she lived in a tent near Góngora's and that he never presented a threat. She reiterated her account Friday. "He wasn't understanding what they were saying," she said, adding that he moved only in reaction to being struck by the beanbag rounds. "He did nothing wrong at all." S. Smith Patrick, a filmmaker, said she was home in her apartment overlooking the street and had a "completely unobstructed view of everything that happened." She said the downward trajectory of some of the gunshot wounds confirms what she saw. "He was not charging at them as had been stated," she said. Smith Patrick commended a recently announced partnership between SFPD and the city's Department of Public Health that will make a team of more than 30 mental health professionals available to respond to incidents involving police. Góngora's death came five months after the fatal police shooting of Mario Woods -- which raised scrutiny of SFPD use of force and officer-involved shooting investigations to an uproar -- and about six weeks before the fatal police shooting of Jessica Williams, which prompted former Police Chief Greg Suhr's resignation. It also raised questions about SFPD officers' commitment to changing the way police interact with people potentially in psychiatric crisis, which can quickly turn volatile and make up a majority of fatal police shootings in San Francisco and elsewhere. Góngora's family portray him as a loving father and husband who had only recently fallen on hard times. They said he had lost his apartment just a few months before the shooting. Despite massive reforms underway in the Police Department, a divide over the city's handling of officer-involved shooting investigations appears only to be growing. The family's supporters cite the inclusion of Góngora's criminal history in his autopsy report as only the most recent example of collusion between what should be independent investigations by police, the district attorney and pathologists with the Medical Examiner's Office. "Civil lawsuits are critical for families who lose a family member or a loved one to police brutality because it is the only way that they can do an independent investigation and actually set the record straight," said Adriana Camerena, who advocates and translates for Góngora's and other families who have lost a loved one in a police shooting. "Luís was never a threat to police officers, and he was unjustifiably and unlawfully killed."